In December 2012 I was delisted from FIDE by my federation, the English Chess Federation (ECF), and could not play in FIDE rated events. 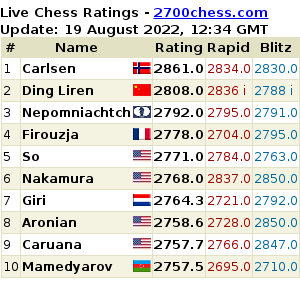 I chose at that time to take a break from competitive chess, but after a while I missed the buzz of the tournament hall, and decided to bite the bullet, rejoin the ECF, get my FIDE rating reestablished and start to play again. I started playing tournament chess again at the start of February after a break of just over a year. Time to reflect on this! First, I haven't been totally free of chess over the past year. I played a couple of 60 minute games, played some chess online, have been teaching chess, and generally thinking about it. But perhaps, that isn't the same as playing the full FIDE rated game which lasts around 4 hours. I have had breaks from the game before, but that was when I was much younger, once around my early 20's, when the break didn't really have any effect, and again in my early 30's. Each time I returned with a new lease of life, a new enthusiasm for the game and a rustiness that lasted a relatively short time. Now I'm in my late 40's, my calculation skills are probably not as strong as they had been when I was younger, and I am finding it takes longer to regain form. Funnily enough, my general strategic thinking is not worse than before, and perhaps is even better, but my pure calculation skills have certainly dropped off. This has shown itself in a number of ways. First, I am taking quite a long time to make decisions. Second, I'm struggling to focus for a full 4 hours and, especially towards the second half of games, I've noticed that I'm not processing variations clearly. Third, I'm missing things that I believe I would have seen before. These are usually simple things like checks and basic tactics, and this is causing me to blunder. Ok, time to take a look at a few examples of my rusty play! Here's a classic miscalculation. 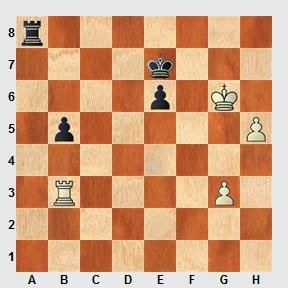 I had arrived at this position as black against Paul Kovacevic, planning to play 21..Ne8 driving white's rook back. I thought I could then play Rd8 and my knight will be able to get to d6 with or without trades of rooks. I thought I had equalised this position. Then I noticed that I might have something "better". I saw an interference tactic cutting off the 2 rooks, and spent an age looking at it, but saw nothing. 21..Bd5? was what I played which I soon regretted when my opponent simply won 2 pieces for the rook with 22.Rxf6. In my mind I had failed to see that the rook could take the knight. Interesting that I should be aware of a line closing feature, but not a line opening feature! Interestingly, 21..Nd5 is a better move as black will get rook and pawn for 2 pieces. Actually, even worse was to come. 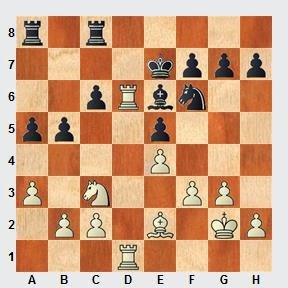 In the above diagram I was playing black against Svetozar Stojic, and again I'd played well up to this point. As black I planned ..Re8 with a good game for black based on the pressure against white's weak e-pawn. However, I was so keen to play it I made a beginner's mistake, failing to examine my opponent's move. White played 21.Rd1 and I whipped out 21..Re8? without thinking. If I'd have listened to my own coaching mantra echoing the famous words of Cecil Purdy then I would have been alerted to white's threat: "Examine ALL checks and captures!" White played the check 22.Nxb6+ winning a pawn and he went on to win the game. Of course, I just needed to play 21..Kb7 and then ..Re8 will guarantee black a good game. Then came last night. I had played energetically, though maybe not fully correctly, sacrificing a pawn for piece play while my opponent's king was stuck in the centre. The game swung backwards and forwards and then I started to spend a lot of time over moves which really shouldn't have taken much time at all. This wasting of time meant that I arrived at a rook ending with just an increment of 30 seconds left to consider my moves. Sometimes, extra time can be gathered by playing a few quick moves but this might come at the cost of accuracy and this can be costly in the endgame where accuracy is paramount. This is not the only error in the game between myself and Simon Schmidt, nor perhaps even the worst, but it is indicative of my lack of form so I'd like to show it. As white, I had maybe 40 seconds to consider what to do. Simon had just retreated his rook to a8, and I tried to buy some time by playing quickly. I played 57.Kg7? which creates a path for my pawn, but ignores what my opponent plans. Simon played 57..Ra4! and the position is level, and we agreed a draw in a couple of moves which was a fair result overall. I wonder what would have happened if I'd had 5 minutes left? 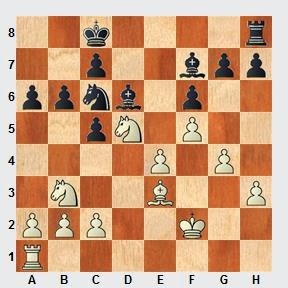 Would I have fallen into pure calculation mode and thought about pushing passed pawns? In the diagram above 57.h6 wins. After 57..Rg8+ 58.Kh5 Rb8 59.h7 white threatens to take on b5, and also just push the g-pawn up the board. To be honest, I'm not sure if I would have seen it and this is another issue with coming back to chess after a lay off. There is uncertainty in my mind about my ability to see things and this is the main reason my play is not at full strength. I'm double and triple checking moves, taking too much time over moves, dithering and my lack of confidence is then exacerbated by simple errors. So how long will this go on until I regain my strength? Or will I ever be as strong as I was? Well, I am optimistic. One thing that has improved over the year I spent off chess is my ability to assess where I'm going wrong. Many adults without trainers/coaches find it difficult to identify their weaknesses and to attempt to correct these. I have seen a number of problems in my play, and I would like to try to remedy these. As a non player I was able to be less subjective about play as mostly I was looking at the games of others. Now as a player I need to be objective in the criticism of my play, and allocate the correct training to resolve the problems in my play. So over the next period, I need to...solve lots of tactical exercises, build up my opening strength, improve my endgame technique, analyse deeply lots of games and positions and....hold on, there's only so much time in life! Another year off would come in pretty handy now. I took 25 years off but have now returned to serious play. I agree with you that confidence about tactics is central. My solution to that problem has been to practice tactics on the Chess Tempo site. The puzzles there are quite challenging. As a result I have found that I am seeing more over the board and feel more confident about my tactics. Of course there are many other issues since chess is a complex game with many aspects to it (eg. endgame, positional play, time management, dealing with losing psychologically) but I think your blog post identifies a general approach that will work. Target the weak aspects of your play and systematically work to improve them.